The supercomputer Cray XC50, nicknamed NS-05 “ATERUI II” started operation on June 1, 2018. With a theoretical peak performance of 3.087 petaflops, ATERUI II is the world’s fastest supercomputer for astrophysical simulations. ATERUI II simulates a wide range of astronomical phenomena inaccessible to observational astronomy, allowing us to boldly go where no one has gone before, from the birth of the Universe itself to the interior of a dying star. ATERUI II is a massive parallel supercomputer and the 5th generation of systems operated by the National Astronomical Observatory of Japan (NAOJ). Linking forty thousand cores allows ATERUI II to calculate rapidly. ATERUI II has three times better performance than the previous “ATERUI” system. A high-speed network enables astronomers to access ATERUI II from their home institutes. In this year, about 150 researchers will use ATERUI II. With its superior computational capability, ATERUI II will tackle problems too difficult for previous computers. For example, ATERUI II is able to calculate the mutual gravitational forces among the 200 billion stars in the Milky Way Galaxy, rather than bunching them into groups of stars the way other simulations do. In this way ATERUI II will generate a full-scale high-resolution model of the Milky Way Galaxy. Computational astronomy is still a young discipline compared to observational astronomy, in which researchers use telescopes to observe celestial objects and phenomena, and theoretical astronomy, where researchers describe the Universe in terms of mathematics and physical laws. Thanks to the rapid advancement of computational technology in recent decades, astronomical simulations to recreate celestial objects, phenomena, or even the whole Universe within the computer, have risen up as the third pillar in astronomy. “Aterui” is the name of a historical hero who lived in the Mizusawa area, where ATERUI II is located. With his comrades he fought bravely against conquerors 1200 years ago. ATERUI II is nicknamed after this brave hero in hopes that it will boldly confront the formidable enigmas of the Universe. The reimagined tensyo kanji (traditional block style lettering) for “ATERUI II” (阿弖流為 弐) designed by artist Jun Kosaka are written on the housing. A web that passes through infinite intergalactic spaces, a dense cosmic forest illuminated by very distant lights and a huge enigma to solve. These are the picturesque ingredients of a scientific research – carried out by an international team composed of researchers from the International School for Adavnced Studies (SISSA) and the Abdus Salam International Center for Theoretical Physics (ICTP) in Trieste, the Institute of Astronomy of Cambridge and the University of Washington – that adds an important element for understanding one of the fundamental components of our Universe: the dark matter. In order to study its properties, scientists analyzed the interaction of the “cosmic web” – a network of filaments made up of gas and dark matter present in the whole Universe – with the light coming from very distant quasars and galaxies. Photons interacting with the hydrogen of the cosmic filaments create many absorption lines defined “Lyman-alpha forest”. This microscopic interaction succeeds in revealing several important properties of the dark matter at cosmological distances. The results further support the theory of Cold Dark Matter, which is composed of particles that move very slowly. Moreover, for the first time, they highlight the incompatibility with another model, i.e. the Fuzzy Dark Matter, for which dark matter particles have larger velocities. The research was carried out through simulations performed on international parallel supercomputers and has recently been published in Physical Review Letters. Through simulations carried out with supercomputers, researchers reproduced the interaction of the light with the cosmic web. Thus they were able to infer some of the characteristics of the particles that compose the dark matter. More in particular, evidence showed for the first time that the mass of the particles, which allegedly compose the dark matter according to the FDM model, is not consistent with the Lyman-alpha Forest observed by the Keck telescope (Hawaii, US) and the Very Large Telescope (European Southern Observatory, Chile). Basically, the study seems not to confirm the theory of the Fuzzy Dark Matter. The data, instead, support the scenario envisaged by the model of the Cold Dark Matter. The results obtained – scientists say – are important as they allow to build new theoretical models for describing the dark matter and new hypotheses on the characteristics of the cosmos. Moreover, these results can provide useful indications for the realization of experiments in laboratories and can guide observational efforts aimed at making progress on this fascinating scientific theme. In a paper highlighted by Astronomy & Astrophysics journal, a team of researchers from the Instituto de Astrofísica e Ciências do Espaço (IA) discovered observational evidence for the existence of two distinct populations of giant planets. So far, more than 3500 planets have been detected orbiting solar type stars. Although recent results suggest that most planets in our Galaxy are rocky like Earth, a large population of giant planets, with masses that can go up to 10 or 20 times the mass of Jupiter (itself 320 times the mass of the Earth), was also discovered. A large amount of the information about how these planets are formed is coming from the analysis of the connection between the planets and their host star. Initial findings have shown, for example, that there is a tight connection between the metallicity of the star and the planet occurrence or frequency. Stellar mass has also been suggested to influence planet formation efficiency. State-of the art models of planet formation suggest that two main avenues exist for the formation of gas giants. The so called core-accretion process says that first you form a rocky/icy core, and then this core draws gas around it, giving origin to a giant planet. The other suggests that instabilities in the protoplanetary disk can lead to the formation of gas clumps, which then contract to form a giant planet. Observations with GAIA (ESA), whose sensitivity will allow the detection of thousands of giant exoplanets in long period orbits around stars of different masses, may shed some light into this. In the near future, missions like ESA’s CHEOPS and PLATO, or NASA’s TESS, which will allow for the study of mass-radius relation, along with studies of their atmospheric composition using instruments such as ESO’s ESPRESSO at the VLT and HIRES at the ELT, or the James Webb Space Telescope (JWST), may also bring new constraints about the processes of planet formation. Artist concept of the planetary body 2014 UZ224, more informally known as DeeDee. ALMA was able to observe the faint millimeter-wavelength “glow” emitted by the object, confirming it is roughly 635 kilometers across. At this size, DeeDee should have enough mass to be spherical, the criteria necessary for astronomers to consider it a dwarf planet, though it has yet to receive that official designation. Lurking somewhere beyond Neptune, the planetary body 2014 UZ224, nicknamed DeeDee, is one of the most distant objects in the solar system. Although DeeDee was lately studied by astronomers using the Atacama Large Millimeter/submillimeter Array (ALMA) in Chile, this faraway dim object still holds many mysteries waiting to be uncovered. 2014 UZ224 is a 635-kilometer-wide trans-Neptunian object (TNO), orbiting the sun every 1,136 years. 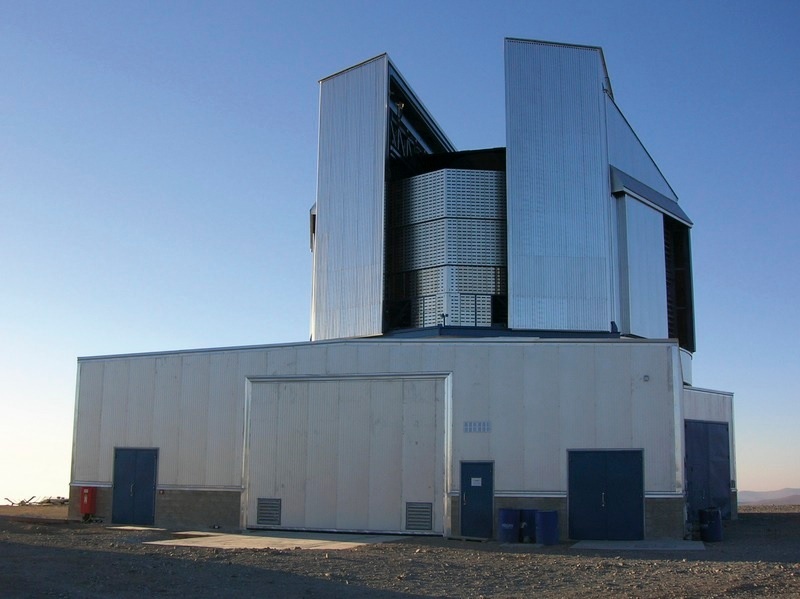 The object was detected by a team of astronomers led by David Gerdes of the University of Michigan, using the 4-meter Blanco telescope at the Cerro Tololo Inter-American Observatory in Chile as part of ongoing observations for the Dark Energy Survey. They announced their discovery in October 2016 and informally dubbed the newly found TNO DeeDee, which is short for Distant Dwarf. Recent observations of DeeDee conducted with ALMA allowed Gerdes and his team to reveal the object’s fundamental orbital parameters as well as its size and albedo. Based on the new findings, the researchers assume that 2014 UZ224 is most likely a dwarf planet with a mixed ice-rock composition. However, more observations are needed in order to draw final conclusions about the real nature of this distant TNO. “We expect to make further optical observations of DeeDee with the Blanco 4-meter telescope during the Dark Energy Survey’s upcoming observing season, from August 2017 to February 2018. These observations will help refine DeeDee’s orbital parameters,” Gerdes told Astrowatch.net. DeeDee’s orbital and physical properties could reveal important insights about the formation of planets, including Earth. Such objects are leftovers from the formation of the solar system, thus could be real treasure troves of information regarding the history and evolution of celestial bodies. DeeDee is currently about 92 astronomical units (AU) away from the sun. This is roughly three times Pluto’s current distance. The object will reach it’s perihelion distance of about 38 AU in the year 2142, when due to its proximity it could be studied by a dedicated probe. Hence, the only opportunity now available to study this TNO is to employ ground-based telescopes or space observatories flying in Earth’s orbit. “A dedicated mission to study this object from close range is not feasible at this time. DeeDee will reach its perihelion distance of 38 AU in the year 2142. Perhaps at that point in the distant future a dedicated mission will be both practical and scientifically interesting,” Gerdes noted. TNOs are icy bodies in orbit beyond Neptune. Observations of these objects could provide better understanding of accretion and evolution processes that governed planetary formation in our solar system as well as in other dusty star discs. Currently, NASA’s New Horizons spacecraft, after completing its flyby of Pluto, is on its way to study such celestial body designated 2014 MU69. This object is about 44 AU away from the sun. New Horizons is expected to arrive there in January 2019. While potentially exciting, the discrepancy with the Standard Model occurs at the level of 2.2 to 2.5 sigma, which is not yet sufficient to draw a firm conclusion. However, the result is intriguing because a recent measurement by LHCb involving a related decay exhibited similar behavior. The figures are published in the annual Basic ESO Publication Statistics published by ESO’s Library and calculated using the ESO Telescope Bibliography (telbib), a database containing refereed publications that use ESO data. ESO makes extensive efforts to identify all refereed papers that use ESO data and considers telbib essentially complete. In 2016, the 13 000th paper was added to telbib, published by a former ESO student and using data from the X-shooter and UVES instruments on the VLT. Interactive graphs of selected statistics are also available online. These graphs display the entire content of the telbib database, which contains records for publications from the year 1996 to the present. They can be used to explore many aspects of the publication history, including the development of science papers using data from ESO instruments and the use of archival data. The most intense source of gamma radiation constructed to date will soon become operational at the ELI Nuclear Physics research facility. It will be possible to study reactions that reveal the details of many processes occurring within stars, in particular those leading to the formation of oxygen. An important part of the equipment will rely on a particle detector built by physicists at the University of Warsaw, Poland. A prototype has recently concluded the first round of testing. Oxygen is essential for life: we are immersed in it yet none of it actually originates from our own planet. All oxygen was ultimately formed through thermonuclear reactions deep inside stars. Laboratory studies of the astrophysical processes leading to the formation of oxygen are extremely important. A big step forward in these studies will be possible when work commences in 2018 at the Extreme Light Infrastructure – Nuclear Physics (ELI-NP) facility near Bucharest, using a state-of-the-art source of intense gamma radiation. High energy protons will be intercepted using a specially-designed particle detector acting as a target. A demonstrator version of the detector, constructed at the Faculty of Physics, University of Warsaw (FUW), has recently completed the first round of tests in Romania. In terms of mass, the most abundant elements in the Universe are hydrogen (74%) and helium (24%). The percentage by mass of other, heavier elements is significantly lower: oxygen comprises just 0.85% and carbon 0.39% (in contrast, oxygen comprises 65% of the human body and carbon 18% by mass). In nature, conditions supporting the formation of oxygen are present only within evolutionarily-advanced stars which have converted almost all their hydrogen into helium. Helium becomes then their main fuel. At this stage, three helium nuclei start combining into a carbon nucleus. By adding another helium nucleus, this in turn forms an oxygen nucleus and emits one or more gamma photons. The experiments planned for ELI-NP will not actually recreate thermonuclear reactions converting carbon into oxygen and photons gamma. In fact, researchers are hoping to observe the reverse reaction: collisions between high-energy photons with oxygen nuclei to produce carbon and helium nuclei. Registering the products of this decay should make it possible to study the characteristics of the reaction and fine-tune existing theoretical models of thermonuclear synthesis. “We are preparing an eTPC detector for the experiments at ELI-NP. It is an electronic-readout time-projection chamber, which is an updated version of an earlier detector built at the Faculty’s Institute of Experimental Physics. The latter was successfully used by our researchers for the world’s first observations of a rare nuclear process: two-proton decay,” says Dr. Mikolaj Cwiok (FUW). The main element of the eTPC detector is a chamber filled with gas comprising many oxygen nuclei (e.g. carbon dioxide). The gas acts as a target. The gamma radiation beam passes through the gas, with some of the photons colliding with oxygen nuclei to produce carbon and helium nuclei. The nuclei formed through the reaction, which are charged particles, ionize the gas. In order to increase their range, the gas is kept at a reduced pressure, around 1/10 of the atmospheric one. The released electrons are directed using an electric field towards the Gas Electron Multiplier (GEM) amplification structures followed by readout electrodes. The paths of the particles are registered electronically using strip electrodes. Processing the data using specialized FPGA processors makes it possible to reconstruct the 3D paths of the particles. The active region of the detector will be 35x20x20 cm3, and at nominal intensity of the photon beam it should register up to 70 collisions of gamma photons with oxygen nuclei per day. Tests at ELI-NP used a demonstrator:a smaller but fully functional version of the final detector, named mini-eTPC. The device was tested with a beam of alpha particles (helium nuclei). “We are extremely pleased with the results of the tests conducted thus far. The demonstrator worked as we expected and successfully registered the tracks of charged particles. We are certain to use it in future research as a fully operational measuring device. In 2018, ELI-NP will be equipped with a larger detector which we are currently building at our laboratories,” adds Dr. Mazzocchi. The project is carried out in collaboration with researchers from ELI-NP/IFIN-HH (Magurele, Romania) and the University of Connecticut in the US. The Warsaw team, led by Prof. Wojciech Dominik, brings together physicists and engineers from the Division of Particles and Fundamental Interactions and the Nuclear Physics Division and students from the University of Warsaw: Jan Stefan Bihalowicz, Jerzy Manczak, Katarzyna Mikszuta and Piotr Podlaski. Extreme Light Infrastructure (ELI) is a research project valued at 850 million euro, conducted as part of the European Strategy Forum on Research Infrastructures roadmap. The ELI scientific consortium will encompass three centers in the Czech Republic, Romania and Hungary, focusing on research into the interactions between light and matter under the conditions of the most powerful photon beams and at a wide range of wavelengths and timescales measured in attoseconds (a billionth of a billionth of a second). The Romanian ELI – Nuclear Physics center, in Magurele near Bucharest, conducts research into two sources of radiation: high-intensity radiation lasers (of the order of a 1023 watts per square centimeter), and high-intensity sources of monochromatic gamma radiation. The gamma beam will be formed by scattering laser light off the electrons accelerated by a linear accelerator to speeds nearing the speed of light. Bright spots on the dwarf planet Ceres continue to puzzle researchers. When recently a team of astronomers led by Paolo Molaro of the Trieste Astronomical Observatory in Italy, conducted observations of these features, they found out something unexpected. The scientists were surprised to detect that the spots brighten during the day and also show other variations. This variability still remains a mystery. The bright features have been discovered by NASA’s Dawn spacecraft which is orbiting this dwarf planet, constantly delivering substantial information about it. These spots reflect far more light than their much darker surroundings. The composition of these features is discussed as the scientists debate if they are made of water ice, of evaporated salts, or something else. Molaro and his colleagues studied the spots on Ceres in July and August 2015, using the High Accuracy Radial velocity Planet Searcher (HARPS), as was reported by the European Southern Observatory (ESO) earlier this year. This instrument, mounted on ESO’s 3.6m telescope at La Silla Observatory in Chile, enables measurements of radial velocities with the highest accuracy currently available. By utilizing HARPS, the researchers found out unexpected changes in the mysterious bright spots. However, at the beginning they thought that it was an instrumental problem. But after double checking, they had to conclude that the radial velocity anomalies were likely real. Then the team noticed that they were connected to periods of time when the bright spots in the Occator crater were visible from the Earth. So the scientists made an association between them. However, these detected variations still continue to perplex the astronomers as they haven’t found a plausible explanation for their occurrence. “We know nothing about these changes, really. And this increases the mystery of these spots,” Molaro told Astrowatch.net. One of the proposed hypotheses is that the observed changes could be triggered by the presence of volatile substances that evaporate due to solar radiation. When the spots are on the side illuminated by the sun they form plumes that reflect sunlight very effectively. The scientists suggest that these plumes then evaporate quickly, lose reflectivity and produce the observed changes. “It is already well known that a lot of water hides beneath the surface of Ceres, so water ice or clathrates hydrates are the most natural hypotheses. But a proper answer will be hopefully provided by scientists working in the Dawn team in the coming months,” Molaro said. He noted that the indication of variability needs to be confirmed by direct imaging of Occator’s bright spot at the highest available spatial resolution. “This kind of measurements are underway. I would say that the detection of a variability improves our ignorance rather than our understanding of this planetary body,” Molaro revealed. The team is currently applying for further observations by the end of this year to repeat in a more systematical way what they have done in their pilot project. An important aspect of their work is to have shown a new way to study Ceres from ground, which could turn out to be useful even after the end of the Dawn mission. However by now, they are eager to see the results from the Dawn spacecraft in the next months. If the team’s theory is confirmed, Ceres would seem to be internally active. While this dwarf planet is known to be rich in water, it is unclear whether this is related to the bright spots. It is also still debated if Ceres due to its vast reservoir of water, could be a suitable place to host microbial life. “Life as we know it on Earth needs liquid water, biogenic elements and a stable source of energy. Is Ceres a good place to have these things simultaneously and for a substantial amount of time, like billions of years? Nobody knows at the moment,” Molaro concluded. A faint blue galaxy about 30 million light-years from Earth and located in the constellation Leo Minor could shed new light on conditions at the birth of the universe. Astronomers at Indiana University recently found that a galaxy nicknamed Leoncino, or “little lion,” contains the lowest level of heavy chemical elements, or “metals,” ever observed in a gravitationally bound system of stars. The study* appears today in the Astrophysical Journal. The lead author on the paper is Alec S. Hirschauer, a graduate student in the IU Bloomington College of Arts and Sciences’ Department of Astronomy. Other IU authors on the paper are professor John J. Salzer and associate professor Katherine L. Rhode in the Department of Astronomy. The study’s observations were made by spectrographs on two telescopes in Arizona: the Mayall 4-meter telescope at the Kitt Peak National Observatory and the Multiple Mirror Telescope at the summit of Mount Hopkins near Tucson. The galaxy was originally discovered by Cornell University’s Arecibo Legacy Fast ALFA, or ALFALFA, radio survey project.